Home #ADDICTIVE Maze Light – Puzzles that are just asking to be solved! 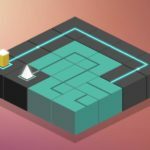 Maze Light – Puzzles that are just asking to be solved! Are you a fan of the classic Pipe-Connecting Games you can find pre-installed on pretty much every old Windows PC? (…Alongside Solitare…?) 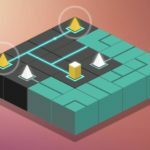 Maze Light is yet another Pipe-Connecting puzzle game for your iOS or Android device that has exactly one distinctive feature. It looks awesome! Maze Light (by 1Pixel Studio) is yet another one of those games that doesn’t really need explaining. Played using a given number of Pipes, (or in this case Tiles), your mission in this game is to connect a number of pyramid-shaped lights(?) to what we presume is some sort of power supply? Although unlike some other games with practically the same gameplay, we aren’t exactly sure as to what we are actually doing, (e.g. Aqueducts – Prevent drought in the city), the gameplay in Maze Light is simple and very straightforward, just tap on a Tile to rotate it. 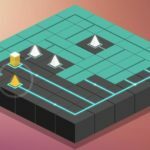 As you progress through the game, the levels will slowly increase in difficulty, (however not a lot), making Maze Light one of the most relaxing puzzle games you will likely ever play. 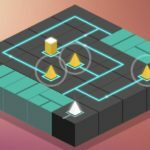 With no “Maximum Number of Moves” or a “Ticking Time Limit” to keep an eye on, Maze Light is one of those truly relaxing puzzle games that does a great job of keeping your brain active without tiring you out. If you’re in need of something relaxing. Something you can fill in your idle time with – without having your fitness tracker suddenly experience a spike in your usually steady heart rate. Maze Light may just be the relaxing puzzle game you’ve been wanting. Welcome to the world of slow and thoughtful puzzle gaming…!